Our highly trained professional staff work together to evaluate your teeth and gums, both visually and with the assistance of modern technology, to discover threats to both your oral and general health. We thoroughly discuss our findings with you as we develop a treatment plan tailored to your specific needs. We offer a wide range of dental procedures that will make a difference in your life. Click on the procedures below for additional information. Sure, there are other options out there for straightening your teeth, but none offers the level of comfort, convenience and confidence that you'll find with Invisalign®. And no matter what stage you're at in life, you'll appreciate how our cutting-edge approach to treatment has minimal interference in how you live, but has a significant positive impact on how you look and feel about yourself. CLICK HERE to see if Invisalign is right for you! Veneers are ultra-thin shells of ceramic (porcelain) or a composite resin material, which are bonded to the front of teeth. This procedure requires little or no anesthesia and can be the ideal choice for improving the appearance of the front teeth. Veneers are placed to mask discolorations, to brighten teeth and to improve a smile. Veneers are an excellent alternative to crowns in many situations. They provide a much more conservative approach to changing a tooth's color, size or shape. Veneers can mask undesirable defects, such as teeth stained by tetracycline and damage due to an injury or as a result of a root-canal procedure. They are ideal for masking discolored fillings in front teeth. Patients with gaps between their front teeth or teeth that are chipped or worn may consider veneers. Generally, veneers will last for many years, and the technique has shown remarkable longevity when properly performed. Dental implants are artificial tooth roots that hold crowns/caps or bridges. To replace failing or missing teeth, dental implants are very predictable (over 95% success), lifelong solutions. Dental implants have many advantages. Give you a temporary cap on the implant on the day of implant placement ("immediate temporization"). We utilize medical-grade CT scans to determine the exact quantity and quality of bone for placement of implants. A root canal is a procedure done to save the damaged or dead pulp in the root canal of the tooth by cleaning out the diseased pulp and reshaping the canal. The canal is filled with a rubber like substance called gutta–percha or another material to prevent recontamination of the tooth. The tooth is then permanently sealed, with possibly a post and/or a crown made of porcelain or metal alloy. This enables patients to keep the original tooth. If you're given a temporary filling, usually on the next visit it's removed and the pulp chamber and canal(s) are filled with gutta percha or another material to prevent recontamination. If the tooth is still weak, a metal post may be inserted above the canal filling to reinforce the tooth. Once filled, the area is permanently sealed. Finally, a gold or porcelain crown is normally placed over the tooth to strengthen its structure and improve appearance. Tooth loss can occur for many reasons including periodontal disease, decay or trauma. Dentures have been used to replace missing teeth for many years. Alternative methods used to replace missing teeth include dental implants and fixed bridges. A complete denture is used to replace all of your missing teeth. If you are only missing a few teeth, a partial denture or overdenture may be used. Dentures are generally fabricated from acrylic resins. With advances in modern cosmetic dentistry, there are a wide variety of materials available for dentures, we will help you make the best choice for your budget and lifestyle. Dentures should be held in place by their natural suction to your gums; sometimes a fixative may also be used. Partial dentures are secured to adjacent teeth or dental implants. Complete dentures can also be fixed securely in place by dental implants or mini implants, which can give you the confidence to eat whatever you want without having to worry about your dentures coming loose or falling out. More patients seem to be opting for treatment with implants now. Though a significant investment, fixed dentures have a dramatic effect on improving the quality of life. It is important to keep your dentures clean at all times. You should remove your dentures at night to give your gums “a rest” and the chance to be exposed to your natural saliva, which will keep them healthy. It is highly recommended that you brush your dentures and soak them in cold water or special soak solution. Always brush your dentures before putting them back into your mouth. If your dentures begin to collect debris or stains that you cannot remove by normal brushing, your dentist or hygienist will be able to professionally clean your dentures for you. It is important to visit your dentist regularly to ensure that your dentures are in good condition and continue to fit your gums, as the shape of your gums and underlying bone can change with time. Loose fitting dentures can cause irritation and inflammation of your gums and problems with eating and speech. Replacing missing teeth is very important. Not just in your physical appearance, but in the health and function of your smile. Contact us to learn more about dentures and partial dentures and find out if they are right for you. Dentures are removable replacements for your teeth, designed to look and function like your own natural teeth and surrounding gum tissues. Today, dentures can look very realistic and natural and feel comfortable. They can even be constructed with the aid of dental implants for greatly increased comfort. Dentist-Assisted Bleaching utilizes highly concentrated carbamide peroxide that is brushed directly onto the teeth, then a custom-fitted bleaching tray is placed. The high concentrations of peroxide can cause irritation to the surrounding gum tissue and should only be applied by a professional. Most often, this procedure is used followed by additional treatments applied at-home by the patient. Power Bleaching utilizes highly concentrated hydrogen peroxide in a carefully applied solution. A heat or light source is used to activate or accelerate the whitening process. This treatment creates the most dramatic results and is used for people with severe discoloration. Treatments can last seven to ten years, depending on your habits. Ask your dentist to evaluate your smile and decide which treatment is best for you! Composite fillings are a mixture of glass or quartz filler in a resin medium that produces a tooth-colored filling. They are sometimes referred to as composites or filled resins. Composite fillings provide good durability and resistance to fracture in small-to-mid size restorations that need to withstand moderate chewing pressure. Less tooth structure is removed when preparing the tooth, and this may result in a smaller filling than that of an amalgam. Composites can also be "bonded" or adhesively held in a cavity, often allowing the dentist to make a more conservative repair to the tooth, and most importantly, create a better seal to the tooth than amalgam. Composites are also used for cosmetic improvements of the smile by changing the color of the teeth or reshaping disfigured teeth. Following the removal of decay, the composite is placed in layers, using a special light to harden each layer. 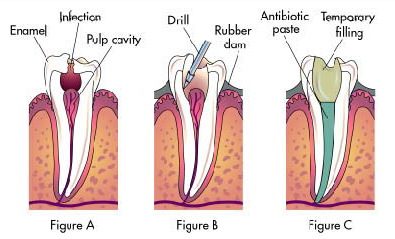 When the process is finished, the composite is shaped to fit the tooth. The dentist then polishes the composite to prevent staining and early wear. The seal that is created when bonding the composite to the tooth is the main functional advantage, but most patients agree that they like the esthetics best. Composites can be blended into the tooth to create a color nearly identical to that of the natural tooth. Composites can also be used to veneer over teeth to greatly improve their color and shape. Your tooth may need to be removed due to a fracture, pain, infection or bone loss. These problems may complicate the extraction procedure, resulting in jaw deformity. To prevent this deformity, we gently remove the tooth with state-of-the-art instruments and place bone material with growth factors to accelerate healing. The newly formed bone provides a foundation for implant placement. Our bone-preserving extraction will greatly improve your smile, and make implant placement more predictable. Our bone-preserving extraction will greatly improve your smile.